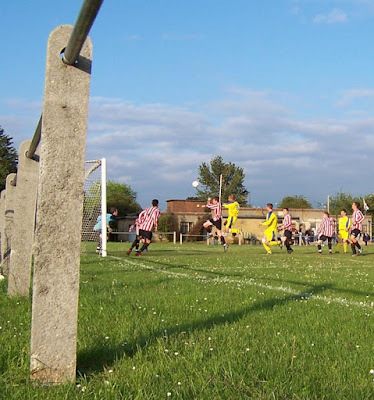 It’s a clement mid-May midweek, and the lower rungs of the non-leagues, those particular struck by winter postponements, are crawling their way to a finish. Your hobo tries to put off the inevitable close season by doing two in a week, a cloudy Tuesday and a sultry Thursday, but decides only to pen up on one of ‘em. My readership, small in number they may well be, I thought, won’t be enthused by two Combined Counties second tier games from the same week, so I’ll just knock a cheeky single off my legs. So, with that in mind, do I sketch out the game that decided the divisional championship in the last minute? No, you just get a picture of a bloke copping a freebie in a treehouse from there. You lucky people. As it goes, both games ended 1-1, as have so many I’ve witnessed this season (10 in 49, 7 in the last 14), but Farleigh Rovers’ last minute equaliser at home to Horley Town snatched the league title from their visitors grasp, and handed it to Farnham Town, who were themselves not doing quite enough, or so they might have assumed, by drawing 2-2 at Warlingham in a game occurring less than a mile away at that very moment. A fairly exciting Tuesday evening in a quite corner of Surrey south of Croydon. Instead then, for you, I present a fairly meaningless end of season beer match, albeit between two of the more free-scoring sides in the division. A promise of a goal-fest draws 113 to Rectory Meadow’s leafy acre, a small strip of greenery where, apparently, old goalposts come to die, about five of them being strewn around the outside of the playing area. I say 113, that’s the official attendance anyway, it certainly doesn’t look that many and it is hard to know how they were able to tell, given that there is no turnstile, nor is any entrance fee taken. Theoretically it is entry by the £2 programme, but it’s a fairly snoozy take on the hard sell technique, the man with mags-in-bag holding court in the concrete cube of a clubhouse, occasionally looking up to raise eyebrows in the direction of anyone looking lost, or in need of some reading matter. He needs to be alert to the presence of eager buyers, as with so little football happening around the country at this time of year, a thermos of hardy groundhoppers have begun to assemble here, some huddled together by a flakey bench and almost consumed by a surrounding, unkempt hedge. Not sure what the collectors would make of Hanworth’s literary efforts. Perhaps its an end of season thing, or perhaps they spend all year round developing a tome that’s more matey than an anthropomorphised bubble bath icon getting pissed up and telling you he loves you. Many programmes are drier than a psoriatic’s elbow, but this effort has a higher in-joke quota than any student union newspaper. There are pages of stats, a half-time quiz with questions like “the quail is the smallest bird of which species?” and a number of pages of pub gags, for which there is an apology from the editor. Not for the fact that they are filler due to a spate of six home games in twelve days, but that the hectic schedule has meant he’s had to repeat some from last season’s magazines. It’s all about the fun here at Hanworth, although this clearly comes at a personal cost. “I am absolutely sick to death of producing programmes!! !” writes the esteemed editor, in the manner of a Wooldridge, Cardus or Glanville. 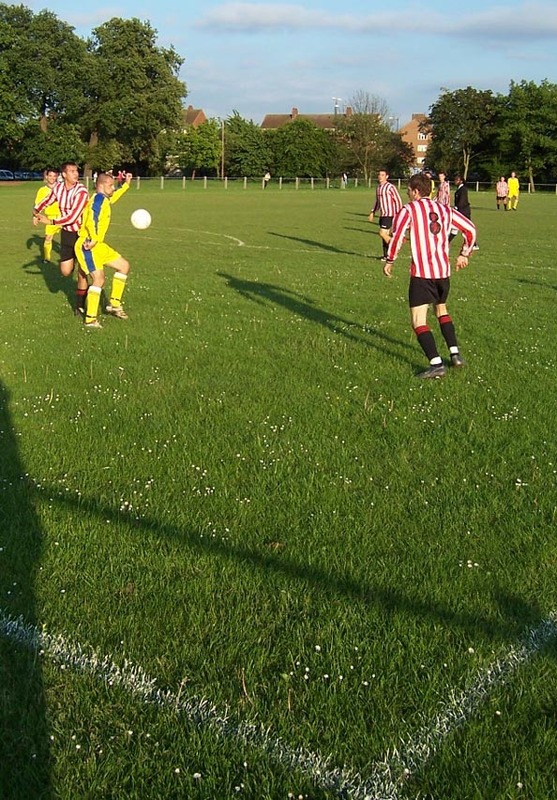 With kits firmly on the agenda, Staines Lammas rock out pristine and iridescent in their yellow, looking for all the world like they’re playing their first match of the season. Perhaps, as we move towards June, they’re treating this is as the first match of their pre-season, and are previewing their kit for their eager replica-hungry public. By contrast, the home sides red and white-ish stripes betray a long hard season, or possibly the presence of a rogue black pant in their manager’s Zanussi. Staines’ keeper shows a little sympathy, sporting the kind of blue sweatshirt usually seen on those about to embark on a summer job painting village hall ceilings. What of the game though? Well, the first half sees the action go end-to-end but without much in the way of clear-cut chances. Staines progression comes through racing onto the long ball over the Hanworth defence, whilst the Villa go about obtaining more width. I imagine kabaddi works in a similar way. At half-time, the subs keep themselves nice and loose by firing shots at goal, and berating each other. One of them executes a nice Cruyff turn but then hits the side netting. “What a bell-end,” chirps his colleague. The second half continues much as the first went on, before the Staines skipper dances through colleagues into the box and shoots on a tight angle, but a defenders leg performs a Banks-off-that-Pele scoop over the bar. Sadly for him, from the corner, the ball pings about a congested six yard box, and eventually goes in of an unluckier set of Hanworth legs. However after 77 minutes, against the run of play, Hanworth equalise and obtain a roar of appreciation from the majority of the crowd that have congregated with their beer on the clubhouse patio, about twenty feet back from the pitchside barrier. A cross from the left, rising like a piano hammer in the calm before the Drang, and a header is guided into the far corner. 1-1, and so it remains. In the end, Staines and Hanworth finish 5th and 6th respectively, and they’ll probably both be quite happy with that, both sides hamstrung in promotion terms due to a lack of floodlighting. Hanworth though should have some twinklers in place soon, and thus will have even more to fight for next year. 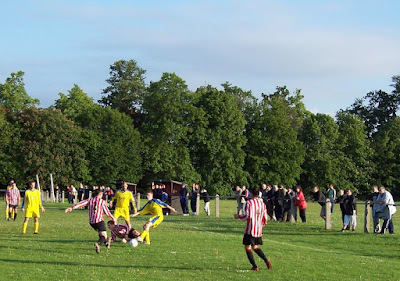 I took in the previous match played by Horley (2-2 draw home to Sheerwater - another last minute goal conceeded) and was down the road at Warlingham when you were at Farleigh Skif. Horley will reflect on what might (should) have been. They were 2-0 up against Sheerwater and coasting.